Prayer is a crucial part of life at the College of the Resurrection; it is deeply sacramental and liturgical, and creates the foundation for everything we do. We start by building prayer into our day, and then build the rest of the day around it. We offer our students the encouragement and support they need to deepen their encounter with God, and to discover patterns of prayer which will support their future ministries. Ordinands take an active part in the liturgical life of the college, and many of our graduates tell us that the pattern of prayer they learned here has sustained them powerfully in their lives of service. Our regular pattern, Monday to Friday, is to gather as a college for morning prayer at 7:30am, and to join the monastic Community of the Resurrection to sing evensong at 6pm. The Eucharist is celebrated each weekday in the College Chapel, immediately following morning prayer. On Thursday evenings, the whole college community gathers at the college Eucharist. Children and families are always welcome at the liturgy, but many especially value the college Eucharist. On Sundays, we join the monastic community for mattins at 7.30am and the Sunday Eucharist. In addition to services in college, many students value the opportunity to join the brothers for at least part of the daily round of monastic worship. On Saturday evenings, a number of students join them for the beautiful Vigil of the Resurrection. Particular highlights of the year include the college retreat in Advent, the guided quiet day in Lent, and the spouses’ retreat in Eastertide. Shared, liturgical prayer deepens and enriches personal prayer, and students are helped to find a rhythm of personal prayer and scriptural reflection which supports attentiveness to God and to one another. Our 22 acres of beautiful gardens mean there is always quiet and space to pray and reflect. A number of students gather for prayer groups, using a variety of styles of prayer. The Christian spiritual life has always valued silence as a way to rediscover our dependence on God and also, paradoxically, to learn to listen better to one another. We believe it is important to make times of quiet within the day, and many students particularly value this. 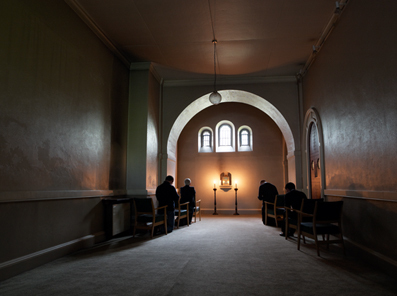 We are unique among English theological colleges in that silence is kept in public rooms and corridors from 9.30pm each day and in the refectory during breakfast on most days. One of the striking features of the Community’s church is the stillness: in the midst of our busy lives, it provides a silent, focused place where we can listen to God without distractions.